Twice last week I bumped into friends while in the midst of busy days. These are women who I adore but haven’t seen in much too long, each of us consumed with the busy-ness of our own lives. Taking ten minutes to dive deep into a visit, while all of life continued to swirl around us felt like a blessing in my day. 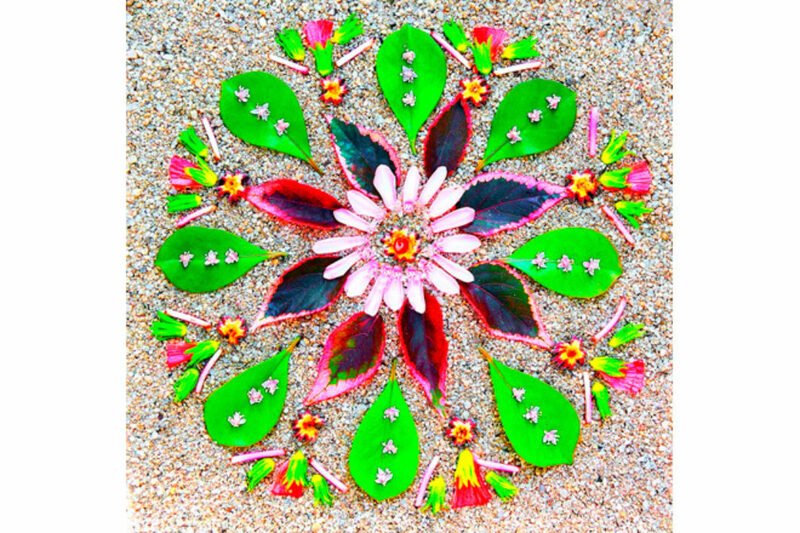 Creating these mandalas, or impermanent earth art, is about “stepping into wonder, imagination, curiosity, and surprise, all of the qualities the wilderness, the natural world, brings forward; all qualities children have in spades. Kids, earth, and art happen without thinking about it. In our culture all impermanent are is subjugated to children, while permanent art is for adults. This idea of impermanence is deeply woven into my work and the intention,” explains Schildkret. Schildkret describes the creation of morning altars as a “practice of being in the presence of change. Sometimes the way you think things should be aren’t like that, and the question becomes, how do you respond to that? I’ve built so many altars, and none of them exist anymore. Some have been destroyed in the process of creating them, a gust of wind comes along and blows away what I have spent hours creating.” We can begin to let go of what we are holding onto by releasing our attachment to what we create. For those who feel removed from the natural world, Schildkret invites them to look around with fresh eyes. He has led workshops in the very heart of cities where, at first glance, there is nothing natural to collect. After foraging, participants returned with a variety of unexpected materials. “When people can practice the skills of curiosity and wonder,” he says, “they realize how much they are missing in the world around them.